Human embryonic stem cells (hESC) have demonstrated the ability to restore the injured myocardium. MRI has emerged as one of the predominant imaging modalities using iron-oxide nanoparticles to localize the transplanted stem cells. However, this method does not monitor biological activities of the transplanted cells including cellular viability. Manganese chloride (MnCl2) is transported via calcium-channel into the cellular cytoplasm to shorten cellular T1 and generate positive contrast indicative of cellular viability. We tested the hypothesis that MnCl2 will enable in vitro MRI assessment of hESC viability. hESC (H9, Wicell, Madison, WI) stably transfected with luciferase reporter gene (hESC-luc+) was cultured on mouse embryonic fibroblast feeder layer or on growth factor reduced matrigel with hESC growth media consisting of basic fibroblast growth factor. The hESC-derived cardiomyocytes (hESC-CM, contractile cells) were generated from embryoid bodies (EBs) and enriched by Percoll gradient. 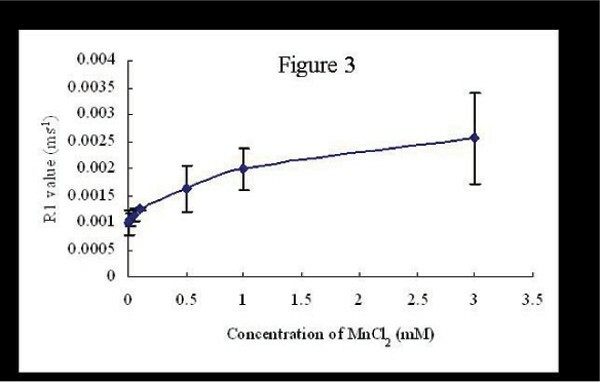 We labeled about 0.5 – 3 × 106 trypsinized hESC with 0.01–3.00 mM of MnCl2 in normal saline and incubated for 0.5–1.0 hour at 37°C. Biological properties of hESC were monitored by modulating the activity of calcium channels using verapamil (calcium channel antagonist) and dobutamine (calcium channel agonist). T1 and T2 mapping was performed at 0.01–3.00 mM of MnCl2 solution with 1.5 T GE Excite whole-body MRI scanner (Signa, GE Medical Systems, Milwaukee, WI) with a 5-inch receive only surface coil. For T1 measurements, spin echo (SE) inversion recovery sequence (FOV 12 cm, matrix size of 128 × 128, TR 3000 ms and TE 50–2200 ms at 300 ms steps) were used. We made T2 measurements using SE sequence (FOV 12 cm, matrix size of 128 × 128, TR 2500 ms and TE 10–80 ms at 10 ms steps). Then the data were analyzed to extract T1 and T2 values through nonlinear least-square fits to the SE inversion recovery and the SE decay curve respectively. In vitro cellular MRI was performed using optimized SE sequence (FOV 12 cm, matrix size of 256 × 256, TR 800 ms and TE 3.4 ms). Modulation of hESC calcium channel activity by verapamil and dobutamine was assessed by measuring changes in signal intensity. The MnCl2 signal of hESC-luc+ viability was validated by bioluminescence imaging (BLI, Xenogen IVIS System 200, CA). Metabolic effects of MnCl2 on hESC were tested using MTT assay for cellular proliferation and flow cytometry detection of Annexin V for apoptosis. In vitro cellular MRI indicates that viable hESC take up increasing amount of MnCl2 with increasing extracellular concentrations of MnCl2 as seen by respective increase in T1-shortening effects (Figure 1). Calcium-channel mediated biological properties of hESC were confirmed by the reduction of difference in signal intensity by 24% when 250 μM verapamil was co-administered with 0.10 mM MnCl2 (p < 0.05, 4264 ± 227 versus 4094 ± 248, n = 4, Figure 1). 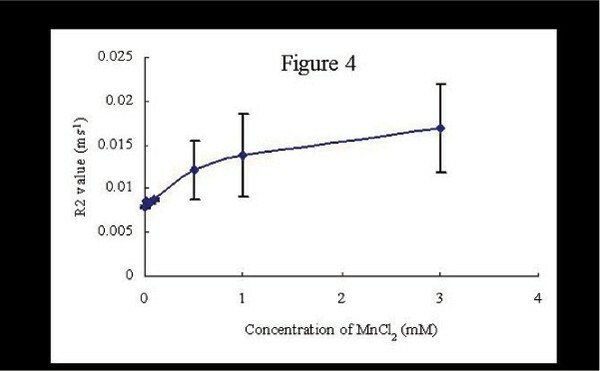 A trend towards increased signal intensity was observed when 100 mg/mL dobutamine was co-administered with 0.01 mM MnCl2 (p > 0.05, 3851 ± 299 versus 3879 ± 278, n = 3, Figure 1). In addition, signal intensity was measured between undifferentiated hESC and contractile hESC-CM demonstrating increased signal intensity (50%) in hESC-CM (97.2 vs. 147.6, respectively, Figure 2). Furthermore, T1 and T2 relaxation times of Mn labeled hESC have been measured (Figures 3 and 4). Finally, positive BLI signal of hESC validated the MRI findings of cellular viability (Figure 5). MTT and flow cytometry assays demonstrated that MnCl2 labeling did not significantly impact cellular metabolism including cell proliferation and apoptosis. Manganese may enable precise in vivo MRI of the biological properties of transplanted human embryonic stem cells. MRI of hESC and hEB in different Mn concentrations. 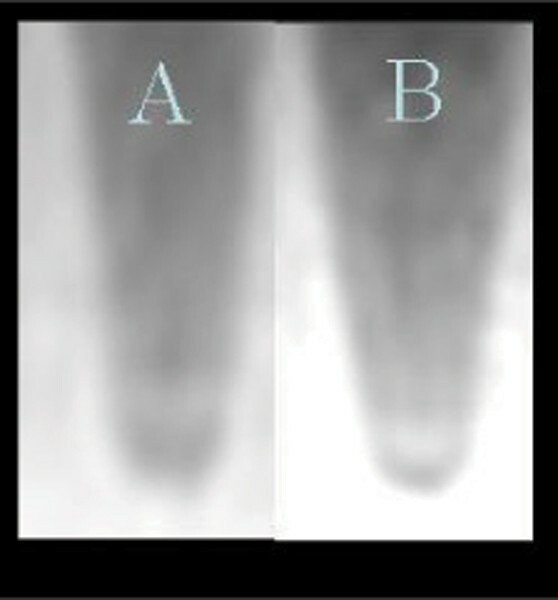 (A) Control (hESCs in normal saline), (B) 0.01 mM Mn, (C) 0.01 mM with 100 mg/ml dobutamin, (D) 0.10 mM Mn, (E) 0.10 mM with 250 mM verapamil. (A) Undifferentiated hESC (uhESC) in 0.10 mM Mn, (B) contractile hESC-CM in 0.10 mM Mn. BLI images of hESC in different concentrations of Mn (A) control (hESC in normal saline), (B) 0.01 mM, (C) 0.05 mM, (D) 0.10 mM, (E) 0.5 mM, (F) 1.0 mM, and (G) 3.0 mM. MnCl2-guided cellular MRI demonstrates the potential to detect cellular viability and biological properties including calcium channel activity and contractility of hESC-CM. This technique may enable precise in vivo MRI of the biological properties of transplanted hESC.